Mabel's Labels ~ For The Stuff Mom's & Dad's Lose! I am super excited to learn that Mabel's Labels has introduced the Mom & Dad Packs! I've been personalizing most of our Skinny Mini Labels in our family surname only because they stuck to shared items ~ books, backpacks, suitcases, strollers, and more. The tough part was picking a colour and icon that would please everyone. I recently found out that you can choose the "NO ICON" option for some products. Also, personalizing by using your phone number is a good option too. It's not as though I don't love cutesy heart icons on my reusable water bottle or travel mug. And I'm sure my hubby loves the choo choo trains on his drum equipment. 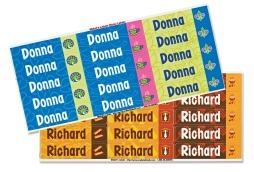 I'm fairly frugal so sometimes order the Sticky Labels because they are bigger even though you get less in a pack (45 labels versus 80 labels in an order of Skinny Minis) and personalize them in my first and last name, then cut them in half. There are some items I only want my last name on, but still need my first name on personal items in the communal fridge at work. These new Dad Pack labels will be my Father's Day gift to a hubby who loves bacon. The Mom Pack includes three colourful designs in shades of blue, and green, with a hint of pink ~ a flower/star burst, a coffee cup, and fleur de lis. The Dad Pack has a fun mix of brown and orange patterns~ a bbq, bacon strips, and a dress shirt with tie icon. Order from www.mabelslabels.com until June 8, 2012. "For the stuff grown-ups lose! Limited edition Mom and Dad Packs make sweet Mother’s Day, Father’s Day or birthday gifts for all the marvellous mamas and papas in your life. Stock up! " Mabel's Labels is also a proud supporter of Inter Varsity Pioneer Camps. Want to find out how to win a week at Summer Camp, a Mabel's Big Kaboodle prize pack, and a trip to Punta Cana? When you enter, you'll get access to Mabel's discounts.